In the world of prestidigitation, there are magic tricks . 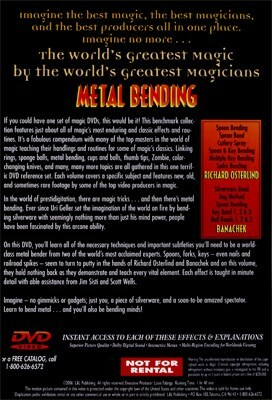 . . and then there's metal bending. Ever since Uri Geller set the imagination of the world on fire by bending silverware with seemingly nothing more than just his mind power, people have been fascinated by this arcane ability. 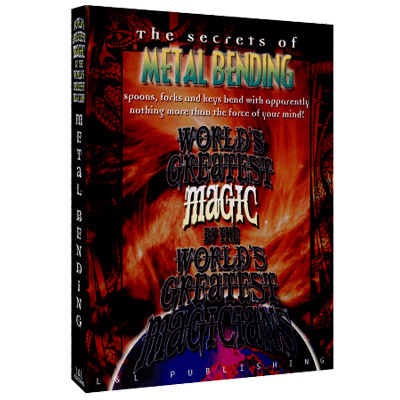 On this DVD, you'll learn all of the necessary techniques and important subtleties you'll need to be a world-class metal bender from two of the world's most acclaimed experts. Spoons, forks, keys - even nails and railroad spikes - seem to turn to putty in the hands of Richard Osterlind and Banachek, and on this volume, they hold nothing back as they demonstrate and teach every vital element. Each effect is taught in minute detail with able assistance from Jim Sisti and Scott Wells. Imagine - no gimmicks or gadgets; just you, a piece of silverware, and a soon-to-be amazed spectator. Learn to bend metal . . . and you'll also be bending minds!